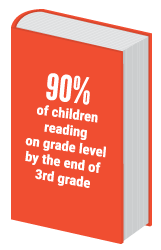 Goal: 90% of third grade children will be reading at grade level by 2025. Did you know that approximately 1/3 of children in Lebanon County are below basic reading proficiency in grade 3? The ability to read by third grade is the single greatest indicator of school success. Reading is the most crucial academic skill because it is the foundation for learning. Children are learning to read through the third grade; then they must read to learn. A student not reading at grade level, by the end of third grade is four times more likely to drop out of high school. Add poverty into the mix, and that same student is six times more likely not to finish high school. When we connect families to literacy supports, we empower them to help their children thrive. If we can prepare all children to enter school ready to learn, keep them in school, increase access to books, and empower and educate families, we as a community are setting up our future generation for successful lives. This then translates into a thriving community for all, united we build our future. to learn. A student not reading at grade level, by the end of third grade is four times more likely to drop out of high school. Add poverty into the mix, and that same student is six times more likely not to finish high school. When we connect families to literacy supports, we empower them to help their children thrive. If we can prepare all children to enter school ready to learn, keep them in school, increase access to books, and empower and educate families, we as a community are setting up our future generation for successful lives. This then translates into a thriving community for all, united we build our future. Seeking to improve literacy in Lebanon County? Let us know! At United Way, we intend to achieve social systemic changes in our community through collective impact. WIth innovative ideas, more people and organizations working together, and a willingness to think outside of the box, we can affect change collaboratively within our community. I am an organization interested in participating in this initiative to ensure that 90% of children are reading on grade level by the end of 3rd grade by 2025. I am an individual interested in volunteering or contributing to this initiative to improve literacy in Lebanon County. © 2019 United Way of Lebanon County. All Rights Reserved.